Guest Post by Dirk Booy: A very thoughtful colleague of my husband’s recommended a book that he knew both of us would like. Well, it was immediately purchased on the Kindle, but Dirk got to it first, and read it on his iPad. Since it is about a topic that is of great interest to him in his life and work, I knew that I would covet his opinion. Here is Dirk’s reaction and I hope to read it myself sometime very soon, and perhaps add a postscript. Thanks so much for the suggestion! help the reader to at least understand the complexities of poverty. both entertaining as well as highly informative. 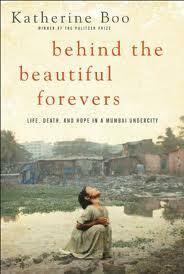 This entry was posted in Four Star, Non-Fiction and tagged Behind the Beautiful Forevers, Katherine Boo, poverty. Bookmark the permalink. No worries! It stays in the library forever! Heard this author on “The Current” this morning being interviewed by Anne Maria Tremonti. It’s getting lots of press.